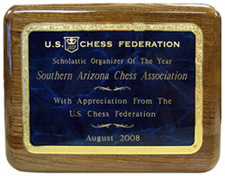 SACA is the proud recipient of the 2008 USCF Scholastic Organizer of the Year. SACA is an affiliate of the United States Chess Federation (USCF). A non-profit 501(c)(3) organization made up of chess players, coaches, and parents dedicated to promoting and developing chess as a significant element of the culture and community in Arizona. An annually elected board of volunteers governs the affiliate towards this interest. SACA is an affiliate of the United States Chess Federation. The Eastside Chess Club (ESCC) offers a place for casual and more serious players to watch and play chess (sets and clocks are provided). The ESCC offers club rated and USCF rated games, monthly and annual tournaments, and Master simuls and lectures. The club meets on Wednesday evenings from 6:00 - 9:45 at the Jewish Community Center on River and Dodge. For more information about the club, refer to the Eastside Chess Club page. SACA organizes and runs chess tournaments throughout the year for both adult and scholastic players. SACA will assist in promoting tournaments and other chess events as deemed appropriate. SACA has helped produce numerous state and national (individual and team) champions, FIDE and USCF Masters, and 1997 World Junior Champion, GM Tal Shaked. Get involved with a game that tests your brain and nerves, or just come out and enjoy a game of chess and meet some new people. Follow the link to Join now!